This book is just what I wanted to kick off summer: a light, fun romance with enough meat on its bones to keep it interesting and great characters. 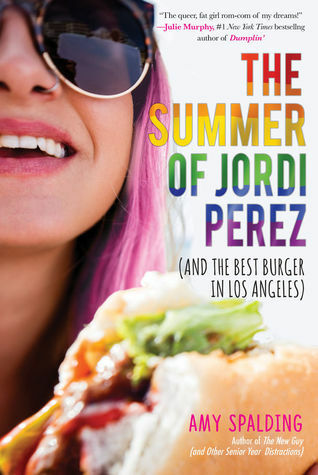 I would definitely recommend starting this season with The Summer of Jordi Perez (And the Best Burger in Los Angeles) by Amy Spalding. I mean, just look at that bright rainbow cover and you know what a fun book you're getting into. When Abby scores the fashion internship of her dreams at a boutique store near her home, she's determined to do a good job. She's heard that this summer internship usually leads to a part-time paid position in the fall and Abby is determined to get the job and start her career in fashion. She has no idea she's going to meet the girl of her dreams, fellow intern Jordi Perez. Abby goes to school with Jordi and rumors fly about how Jordi committed arson and went to Juvie, but all Abby can think about is how good it feels to earn a rare Jordi smile. Oh, and the fact that they're competing against each other to earn the fall job. And Abby's got abundant free time to obsess over Jordi since her best friend is newly in a relationship and her older sister is not coming home for the summer for the first time ever. Luckily, a new unlikely friend, lacrosse-playing Jax, recruits Abby for a quest to find the best burger in Los Angeles. And Jax is a ready sounding board for Abby's pursuit of her crush. The combination of summer romance, a quest for burgers, and Abby's passion for fashion made this a really fun read that's perfect for light summer reading. I really appreciate Abby's body positive attitude - she's defined vaguely as "plus sized" - and her quest to enjoy and promote fashion fun at all sizes. I also think this was a very realistic portrayal of a bigger girl being body positive but also being unsure about some things. Abby doesn't love having her photo taken and refuses to post her own photo on her fashion blog. She's self-conscious about being in a swimsuit, even just with her friends. Even though Abby's on the path to body acceptance and she's an advocate for enjoying fashion at any size, she's still got her hangups and that's very realistic. This is a light romance without a lot of physical action, so a good choice for teens who like romance but don't want graphic physical scenes. Hand it to teen romance fans looking for a breezy, fun summer read. Everything Leads to You by Nina LaCour is another teen lesbian romance that has a similar light, romantic tone and gives a peek into the world of film production much like Jordi gives a peek into the world of boutique fashion. I Believe in a Thing Called Love by Maurene Goo is another light teen romance with an upbeat, breezy tone and that doesn't have a lot of physical romance. The Summer of Jordi Perez (And the Best Burger in Los Angeles) by Amy Spalding. Grades 7+ Sky Pony Press, April 2018. 224 pages. Review copy provided by my local library. What My Niece is Into: Swimming!